Discussion in 'Western Europe 1943 - 1945' started by Skipper, Oct 24, 2016. This is small tribute to Georges Blind. He was a fireman from Belfort, France and was arrested in October 1944 for Resisitance activities. 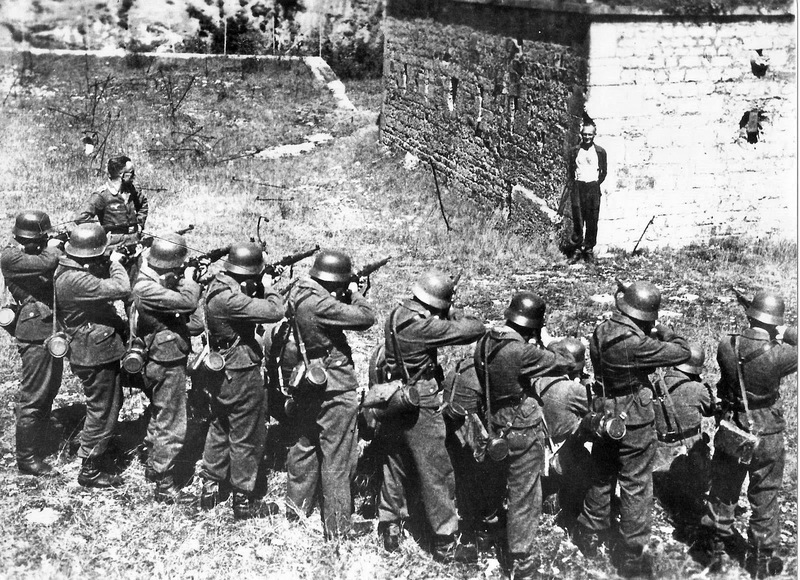 He refused to speak so the Nazis made him undergo a mock execution , hopng his comrades would speak. It didn't work either. The Germans then deported him to a concetration camp (Blechhammer) where he was murdered in November 1944. The picture was brought to a civilian French photographer who secretely developed a copy of the picture which surived the war. This was a mock execution attempting to get the resistance fighter, Georges Blind, to talk. It didn’t work. Georges did not divulge any information. It’s interesting how they’ve placed him at the corner of the building rather than against the stereotypical flat wall. It must make ricochet injuries to the firing squad members much less likely. Of course this was a mock execution, but most likely they used the same site for real executions. Georges Blind was eventually forwarded to a concentration camp, where he was selected for termination on arrival, dying some time in late November 1944. Tamino, KodiakBeer, The_Historian and 2 others like this. The Nazis were experts in squeezing out the truth of prisoners. Even with the most horrible methods someone can think of and beyond. For me as a german this is something i am ashamed of and i can understand why people from other european countries were very reserved towards us for a long time. A great story of a very courageous man. And I like the then/now photos. Thanks for posting, Skipper. I saw the picture before but I've never heard the story behind it. Thanks for sharing it with us! What's incredible is the way he and some of his friends were eventually killed. The Germans deported them to the Gleiwitz area, but to be sure they could kill them at once, they pretended they had a contagious illness and had to be "evacuated". This is how the victims ended in Blechhamer which was in fact intended for Jews rather than Resistants. (even though some could be both ) . Was this hastened murder because they feared trouble from people who did not fear them? One will never know. I can only imagine that Georges Blind may have helped his comrades until the end. This is only a supposition ,but the fact that he was a fireman must have inclined him to bear more than an average civilian. He was from Forbach (Lorraine) and the Mayor of this town has recently inaugurated a street to honor Mr Blind. I'm afraid they won't need it anymore , but thanks anyway.